To complete its celebrations of the 30th anniversary of the Record Office, the Record Office and the Friends are organising an exhibition weekend in the Guildhall on Saturday and Sunday 24th and 25th September – Berwick Record Office, Past, Present and Future. 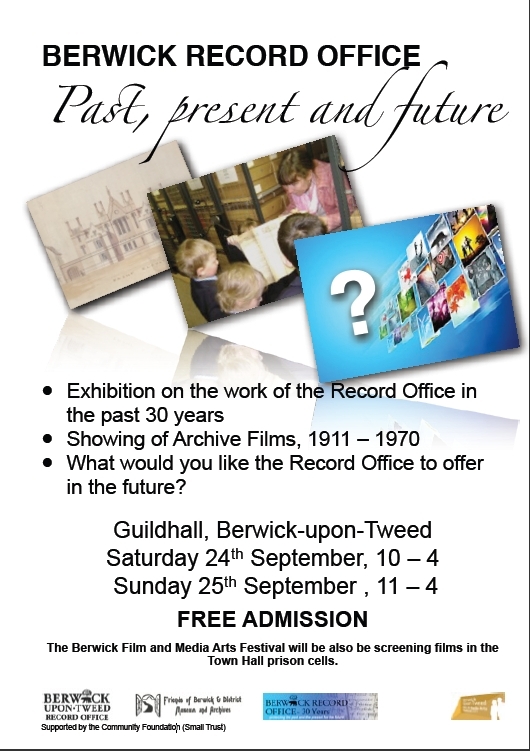 As well as the exhibitions, they will be showing some of their archive films in the Council Chamber whilst the Film and Media Festival will be showing some of their films in the Old Gaol upstairs. The Guildhall is in Berwick-Upon-Tweed, England, TD15 1BN. Map. That talk will be at the Corn Exchange, Market Square, Melrose, TD6 9PN and starts at 2.30 pm.